How Much Traffic Does Yahoo Send You? Home > Yahoo > How Much Traffic Does Yahoo Send You? 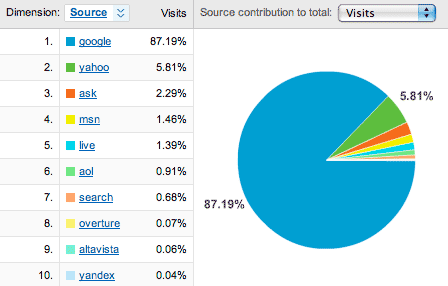 A WebmasterWorld thread asks how much traffic Yahoo sends to your site. So I thought it would be fun to poll our audience. I assume many of you use Google Analytics, so login to https://www.google.com/analytics/ and click on "Traffic Sources," and then "Search Engines." Then below the chart, but above the graph, it says, "Views", click on the circle or pie chat image. Then it will show you, by search engine, how much traffic each engine sent your way for the past month. This post was prewritten and scheduled for delivery today.